Wow, we�re already up to our final offer of the sale � how the week has flown! Our best-selling Portraits ebooks by the amazing Gina Milicia only $7 each! And at just $7 each, you save an incredible 65%! Grab the whole set for an amazing $21! Tens of thousands of photographers from all around the world have significantly improved their portrait photography with this series, and this is your chance to own them all. 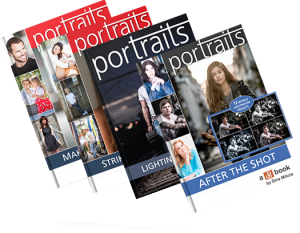 We�ll even include our 14 Recipes for Amazing Portraits ebook as an added bonus, too. So that�s 5 great dPS ebooks and close to $90 worth of value! Individual Portraits titles, or the whole set plus bonus ebook. Whichever you decide, just be sure to get in before the deal ends in 24 hours� time!